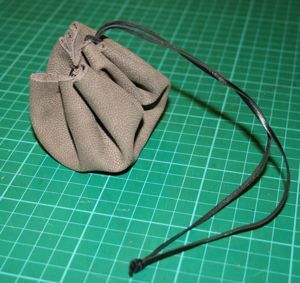 A simple pouch is something you need to carry small items such as money and personal items with your costume. This is a no sew project, based on a simple Viking pouch excavated at Hedeby, which was a Viking trading settlement located in what is now Denmark. 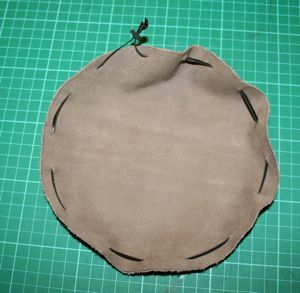 A square of fairly soft leather, at least 15cm x 15 cm (preferably vegetable tanned, not chrome-tanned if you want it to be accurate to period). A small wooden bead with a 2mm hole. 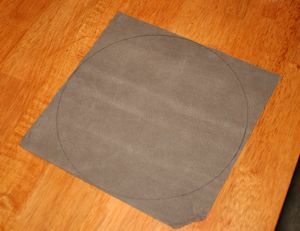 Cut small slits, parallel to the edge of the piece of leather, about 5mm in from the edge. Slits should be approximately 4-5cm apart. 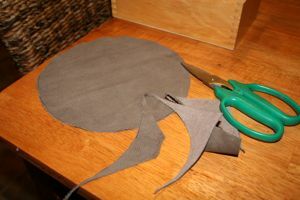 Thread your piece of leather thong through the slits, in and out, all the way around, starting and finishing on the outside of the leather (if there is a smooth side, this will be the outside of the pouch). 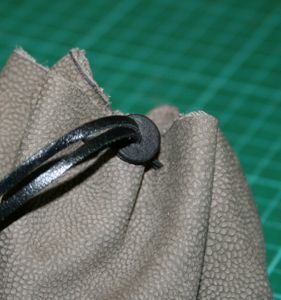 Thread the two ends of the leather thong through the centre of the bead so that the bead can slide up and down the two pieces and draw the circle into a simple pouch. Tie the ends of the thong together using a tight overhand knot, to stop the bead dropping off. Now you have a simple pouch. The design is from a Viking find, but this design would have been used in later centuries as well, to make quick pouches when fabrics for fancier ones weren't available. All you need to do to be able to wear your pouch, is to loop the thong or cord over the belt you wear with your historic costume, and pull the pouch through the loop before filling it with things you need to carry around. If you have a question, or you're stuck, we welcome questions, so feel free to ask! You can even add a photo to illustrate your problem if you like.